Lime juice provides a host of nutritional benefits. It is loaded with vitamin C, magnesium and potassium and has anti-inflammatory properties, may aid in digestion, reduce the risk of certain types of cancer; it is good for your skin, promotes weight loss, reduces the risk of heart disease, lowers blood pressure, lowers blood sugar, and prevents the growth of micro-organisms. Plus, it is extremely tasty and refreshing. Raspberries have been consumed by humans for thousands of years and they are also packed with a host of positive health benefits: helping to prevent memory loss, helping to protect your eyes against UV damage, benefits to digestion, detoxification and disease prevention, cardiovascular benefits, and cancer prevention. When you add the two together, the combination is so sublime that you will forget all about the health benefits! In a quart-sized jar or pitcher, mix lime juice with 24 ounces water. Add stevia to taste. (I used a stevia-erithrytol blend and added 2 tablespoons.) Mix well. 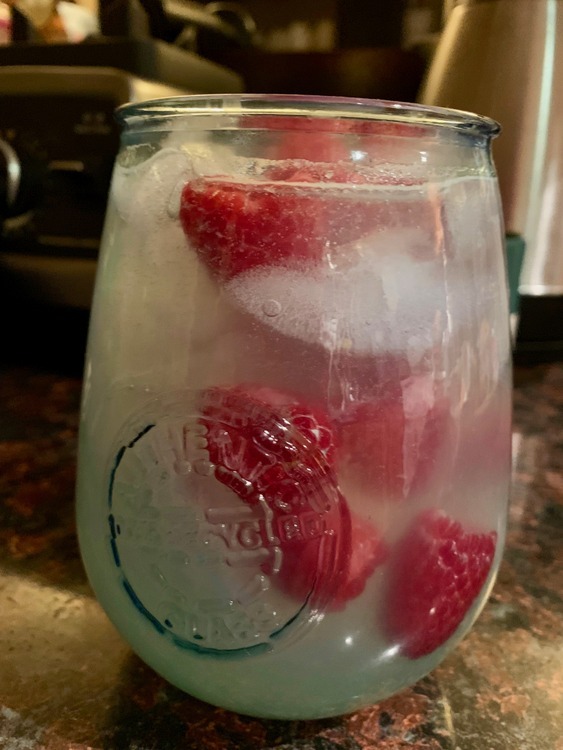 Fill two large glasses 1/3 of the way with ice, add a layer of 5-7 raspberries and add another layer of ice and raspberries. Stir with a spoon to partially macerate the raspberries. Pour limeade mix over ice and raspberries into both glasses and serve immediately. This is particularly nice garnished with fresh mint leaves, if you've got them!